Two years on, MH370 kin want search extended. (AFP) - Families devastated by the loss of flight MH370 vowed Sunday never to quit fighting for answers in the aviation mystery and said the huge search for the Malaysia Airlines plane should continue until something is found. Families gathered for a poignant ceremony in Kuala Lumpur ahead of Tuesday's second anniversary of the jet's disappearance and to argue for an expansion of the search if the current area being scoured comes up empty. "We are fighting to search on because our loved ones are not home yet. So how can we say it’s the end?" said Jacquita Gonzales, wife of flight steward Patrick Gomes. The unprecedented Australian-led hunt for wreckage from the Boeing 777 is expected to finish its high-tech scanning of a designated swathe of seafloor in the remote Indian Ocean by July. Australian, Malaysian and Chinese authorities plan to end the search -- projected to cost up to $130 million -- at that point if no compelling new leads emerge. A piece of the plane washed up on the French-held island of La Reunion last year, and new debris that is yet to be confirmed as from MH370 was found on a Mozambique beach last week. But the finds came thousands of kilometres from the suspected crash zone and have yielded no clues. In one of aviation's greatest enigmas, the plane inexplicably vanished during an overnight flight from Kuala Lumpur to Beijing, carrying 239 passengers and crew. Citing imprecise satellite data, search authorities believe it flew for hours to the remote southern Indian Ocean and went down. Many relatives remain unconvinced that authorities are searching in the right place. "If they have exhausted one particular line of inquiry, that doesn’t mean other areas may not come up with something. Just sit down and ask, 'OK, what next'?" said K.S. Narendran, an Indian national whose wife Chandrika was aboard. Authorities hope to detect debris far down in the ocean depths and eventually recover and analyse the black boxes for clues. Martin Dolan, chief commissioner of the Australian Transport Safety Bureau (ATSB) and head of the challenging operation, told AFP last week he remained "very hopeful" something can be found before the 120,000-square-kilometre (46,000-square-mile) search zone is fully scanned. Many next-of-kin accuse the airline and Malaysian government of letting the plane slip away through a bungled response and covering up what caused the disappearance. Some also allege Malaysia wants to stop searching to prevent embarrassing information from emerging, which the airline and government strongly deny. 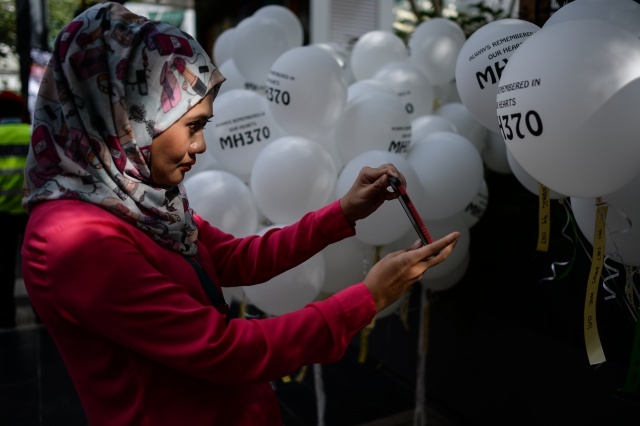 Sunday's ceremony included prayers, musical performances and the release of 240 white balloons, one for each passenger and another for the plane. Relatives say acceptance of their unexplained loss remains impossible two years on. "We don’t have anything to accept. We still know nothing and we are all in limbo. If anything I am worse than before," said Grace Nathan, a Malaysian attorney who lost her mother. Added Gonzales: "We will fight on to make sure that we get the truth of exactly what happened to all of them. We will not give up."